New Super Mario Bros. DS and its Wii follow-up showed that there's plenty of life for Mario in the old side-scrolling formula yet. 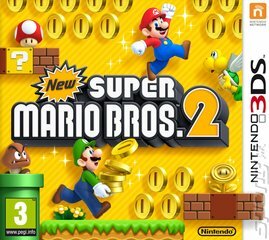 New Super Mario Bros. 2 takes the series to yet another new platform and gives the plumbing brothers yet more classic platforming to battle through. To spice things up, New Super Mario Bros. 2 has a new hook to keep you playing - an emphasis on gold coins. In every stage, the amount of coins youve collected are tallied and saved, with an option for you to return later and beat that figure by playing more skillfully. Theres more - by accessing certain areas, hitting switches or passing through the right hoops, you can manipulate the level to become a potential gold mine. This can produce some absolutely lovely moments during play. You can transform enemies into gold and collect coins as you chuck Koopa shells around the stage. Activating a particular trigger - be it by switch or by simply jumping in the right place - can result in the screen being filled with a torrent of gold coins. You can even pick up a gold fireflower, which will turn Mario into gold and give him the ability to chuck large golden fireballs at enemies. Theres plenty more to enjoy in New Super Mario Bros. 2 for the platforming fan. There are Boo castles, chain chomps, Hammer Bros and massive Bullet Bills. Mini Mushrooms, warp pipes, Tanuki suits, fire flowers and invincibility stars. For those looking for something a little bit extra (and there are over 80 stages to complete in the main story, after all) you can take part in a new mode called Coin Rush. This challenges you to play through three random stages with an extremely tight time limit - the aim being to collect as many gold coins as humanly possible whilst clearing the levels. You can even switch on StreetPass to encourage other players to beat your best times.